Among those 80%, content is the biggest challenge. Asked to identify the single most important factor hampering successful demand generation campaigns, a plurality (37%) cite content that "isn't engaging or provocative," whereas 31% cite a lack of sales and marketing alignment, and 12% cite budget constraints. 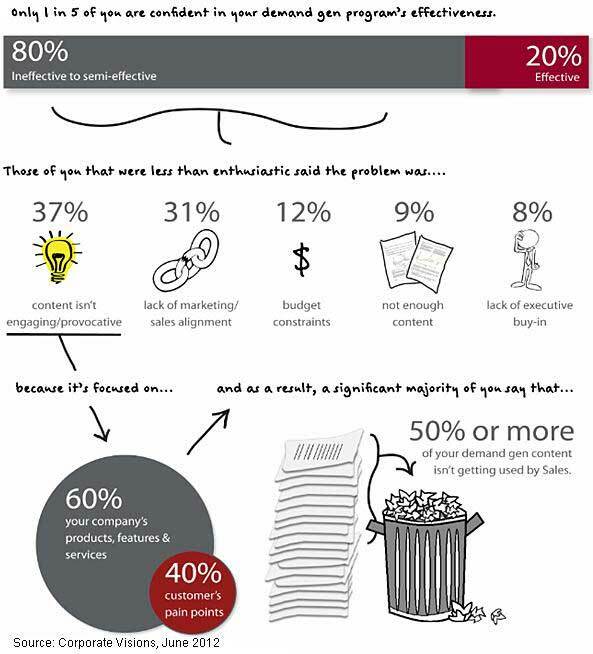 Some 9% of B2B professionals say they don't have enough content. Moreover, campaign messaging lacks a customer focus: 60% of B2B marketing and sales professionals say their organization's demand generation campaigns focus solely on their own company's products, features, and services—rather than focusing on their customers' pain points.